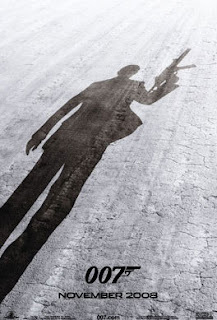 Despite there being massive press coverage that 07 November 2008 was to be the release date for Quantum of Solace, it appears that the UK date at least had been pushed forward as it was with Casino Royale in 2006! The new date for the 22nd outing for Commander James Bond, the 2nd for Daniel Craig in the role of the British superspy is now October 31st; a week earlier! A new (possibly titled Quantum Of Solace) James Bond video game was scheduled to appear in May for all platforms, the original release date for the movie but Activision, the new James Bond video game licence holders have pushed back the new game to coinside with the movie's release. Undoubtedly as with all games I'm sure it would benefit from some extra months in the "oven". Peter Lamont the production designer who worked on 18 previous Bond movies had retired and his position has been filled by Dennis Gassner. Gadgets will be more plentiful than in Casino Royale but will be somewhat more realistic than the gadgets of old. Amy Winehouse is currently the hottest tipped to sing the theme song. The 3rd Annual Whopper Awards! Bush all for Torture - This is a good thing!